Choosing any type of insurance plan can be a daunting task because there are so many factors to consider. What are your risks? How much coverage do you actually need? How much will it cost? The stakes only get higher when it comes to life insurance, because it’s the one type of insurance that requires your death in order for its benefits to come through. You want your beneficiaries to be protected in the event of your untimely death, but you don’t want to pay exorbitant premiums every year on the off-chance that you live to be 105! Fortunately, there are solutions for you at all stages of your life. 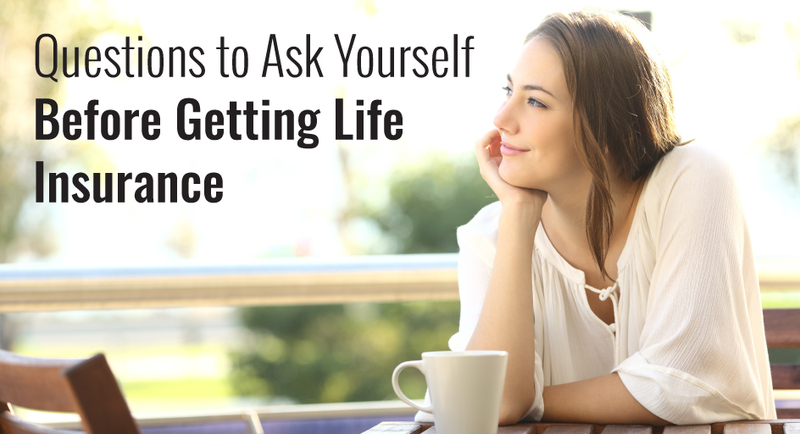 We’ve put together a few questions you should ask yourself when considering life insurance policies, so you can feel comfortable choosing a policy that only covers what you need. If you get for an individual life insurance policy (one not offered through your employer), one of the first things you may need to do is take a physical exam. This is good news if you have great health! Being healthy actually keeps your premiums lower, so you will want to opt for an exam when picking your insurance policy. However, if you have major health issues, there are individual life insurance plans available that do not require an exam. The premiums on these are more than what a healthy person pays with an exam, but you will still be saving money if you know your health problems would seriously increase your premiums. Get a regular check-up to verify how healthy you are before talking to an agent to weigh your options. People depend on you no matter what stage of life you are in, but just how much? The answer to that question will determine so much about your life insurance policy. If you are single with no children and no major debts, you probably won’t need any coverage beyond your group policy, which will cover any funeral expenses and small outstanding debts for your family. If you are under 40 and in decent health, with a spouse and children, a term life insurance policy is usually a good, inexpensive option. This policy will care for your loved ones in the event of your unexpected passing. It is generally large enough to pay off your home and debts, which gives your family time to grieve and figure out their future finances in peace. If you take care of a dependent for the duration of their life, such as a special needs family member or elderly parent, their needs will also have to be taken into account when you purchase a life insurance policy. How Much Life Insurance Can I Afford? As with any insurance, this really just depends. Group life and term life policies exist for “covering the basics” so to speak. These are usually the most inexpensive policies, and they do a good job at getting your beneficiaries back on their feet. Permanent life insurance is more expensive. In some cases, it is necessary for making sure a beneficiary with special needs is covered long-term after your passing. In other cases, you may want to look into permanent life insurance if you can afford the higher premium and would like to give your loved ones extra benefits, like premiums that do not increase with changing health conditions, and a good cash value you can use to borrow against throughout your life. Whatever your needs may be, our agents know the ins and outs of insurance, and we want to answer your questions! Reach out today to start discovering your life insurance options.